David Petraeus, the retired general who headed the Central Intelligence Agency until details of a sordid affair drove him to resign in 2012, was sentenced on Thursday for leaking classified secrets to his former mistress. Petraeus appeared at the federal courthouse in North Carolina on Thursday afternoon to plead guilty to one count of unauthorized removal and retention of classified information, a misdemeanor. He was sentenced to two years of probation and a $100,000 fine. The judge raised the fine from $40,000 in the plea agreement to “promote respect for the law and adequate deterrence.” Petraeus has to pay the fine immediately, or in $25,000 monthly installments. “I now look forward to moving on with the next phase of my life, and serving this great nation as a private citizen,” Petraeus said in a short statement outside the Charlotte courthouse. Federal prosecutors had previously recommended pursuing felony charges against Petraeus, but accepted a plea deal signed in early March. Investigators had originally opened up a probe against the then-CIA director in 2012 after a Florida socialite received threatening messages which officials were able to tie to Broadwell. In the midst of that investigation, authorities discovered that Broadwell had obtained sensitive United States documents and launched a new probe to identify the source. Meanwhile, attorneys for Stephen Kim—a former State Department official convicted recently of leaking to the media—sent a scathing letter to the Justice Department last month in response to what they called a “profound double standard” evidenced by the Petraeus plea agreement. 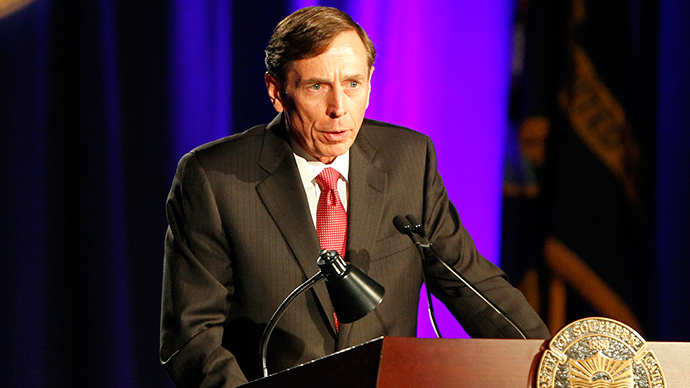 “The decision to permit General Petraeus to plead guilty to a misdemeanor demonstrates more clearly than ever the profound double standard that applies when prosecuting so-called ‘leakers’ and those accused of disclosing classified information for their own purposes,” Kim’s lawyer, Abbe Lowell, wrote three days after the ex-CIA chief pleaded guilty.